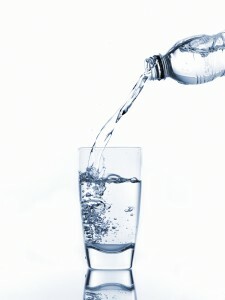 You are here: Home / Improving Your Health / How Much Water Should You Drink Each Day? Second to oxygen, water is the most essential to our survival. Water is necessary for for the proper lubrication of our eyes, joints and skin and our bodies use water for every function from transporting nutrients to maintaining our body temperature. The amount of water required should be increased if you live in a hot and/or dry climate or exercise a lot. You should make sure that this fluid intake comes from clear water rather than juices, colas or milk. A more modern formula for calculating the amount of water we should drink takes into account the idea that the amount of fluid needed by an overweight person compared to a thinner person varies. Therefore the following calculation is recommended: divide your weight by 2 to get the amount of water that your body needs per day. The easiest way to know if you are drinking enough water and whether you are dehydrated is to observe the color of your urine. You are fully hydrated if your urine is a light yellow color or almost clear. You are dehydrated if your urine is darker yellow or amber color. Please note that vitamins that contains riboflavin, can cause your urine to be a bright yellow. Don’t wait until you are thirsty to drink water – drink it throughout the day.